Standing, grasp barbell with shoulder width grip and, with elbows at your sides, raise until forearms are near upper arms and then lower until arms are again nearly fully extended but avoid locking out the elbows at the bottom of the exercise. Keep elbows tucked to your sides and in the same position throughout the exercise. Try to keep the entire body relatively motionless with only the forearms moving as you perform the exercise. Keep wrists straight (in line with the forearms, don’t let them sag down). Feet are shoulder width apart with the goal of creating a solid base. If more comfortable, one leg can be moved back to increase stability. Knees are slightly bent. It is really pretty rare to see biceps curls done without some measure of “cheating” taking place. Cheating occurs when you let other muscle groups and/or gravity assist with the lift. Most commonly, this is seen on biceps curls when trainers bend back at the waist to assist with the raising of the weight. It is also seen when trainers just get their whole body involved in some awkward rocking motion. Reduce the weight load to one you can handle without cheating. Slightly bend the knees, locked knees will encourage swaying. Tighten the abs as you perform the exercise. Bend slightly forward at the waist and consciously keep this position throughout the exercise or consciously push the chest slightly forward each time you raise the weight. 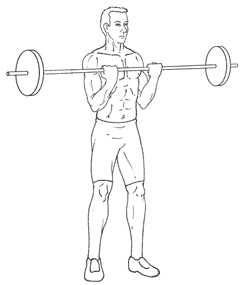 The way you grip the barbell can be a factor in what part of the biceps you are targeting. Narrower grips tend to target the long head (the top or peak of the biceps) while wider grips will better target the short head (inner biceps). Prone Incline Curls – Done with knees on the seat of an incline bench and front of body laying against the back of the bench. hands dropping down, you curl the weight back to the shoulders – can be done with dumbbells or a barbell. Drag Curls – The same motion as the barbell biceps curls except you are allowing the delts more involvement and finishing off the exercise by dragging the weight up the chest. Machine-Based Biceps Curls – Cable machines as well as some lever based machines allow you to perform biceps curls. Past the Barbell Biceps Curls and Preacher Curls, you are looking at dumbbell exercises to best target the biceps with free weights. The Alternating Dumbbell Curls would be your best bet. Pull-Ups are also very effective for biceps development. To stick with a barbell, you can do Prone Incline Curls (see above).